Cosmic Catnip Alpine Climb Cat Scratcher is the first economical scratcher that places the scratching block in an inclined position so the cat can climb and stretch as it scratches. It has holes to allow the cat to sink his claws into the scratcher (instead of your furniture) to clean his claws. Size: approx.43 21cm. Material: Corrugated paper. Quantity: 1 Pets Chew Toy. Type: Cats. Toys Type: Chew Toys. Pruven Scratch Protection Film from 3M. A lot of 4. (1) Easy grow organic oat grass kit. KITTEN CAT STARTER KIT w SCRATCHING PAD, ORGANIC CAT NIP, CAT NIP TOYS, OAT GRASS KIT & FEATHER WAND TOY - NEW! The scratching pad, cat nip infused toys and wand are in assorted prints and colors so may not be the exact pattern or color shown here. 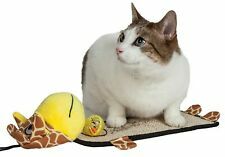 Purrfect Stretch COLORFUL BUBBLES Cat Kitten SCRATCHING PAD POST WITH CATNIP! It is made of specially cut, eco-friendly corrugated cardboard and shaped in a sleek, contemporary design with a colorful bubbles print. It is contoured especially for your cat to nap and scratch in various positions and sits with stability on the floor. We know that cat is used to scratching any thing around by its sharp claws. To minimize the loss it will bring, it is a must have to buy a claw-grinding plate for amusing cats. Its wave shape makes this plate distinctive from ordinary one. NEW The Original Cat Scratch Lounge Classic - Reversible – Cats Love It!!!! Here’s “The Original Scratch Lounge Classic” cat scratcher. THEY ARE USUALLY NOT IN PERFECT CONDITION! THERE MAY BE. NORMAL MINOR WEAR OR IMPERFECTIONS. I DO ATTEMPT TO DESCRIBE AND PHOTOGRAPH IN SUFFICIENT DETAIL THAT YOU KNOW EXACTLY WHAT YOU’RE GETTING! Catit Scratcher with Catnip, Narrow. A cat's need to scratch is instinctive. Catnip is included and by using the Catit Scratching Board, you are helping your cat stay active and healthy. Catnip included. Place the catnip underneath the scratcher. Cardboard Scratcher Refills. Planet Petco. 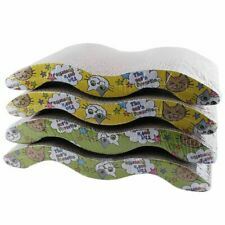 SmartyKat SuperScratcher Catnip Scratcher-2"X5.125"X18.75". Condition is New. Shipped with USPS First Class Package. Corrugated cardboard is the No.1 scratch material BUT cats love the feel of the surface for resting and relaxing too. 【MAXIMIZE PROTECTION OF FURNITURE】Cat couch protector works on any upholstered furniture. Whether it is a couch, chair, carpet or love seat, this product can protect them from cat scratch. The vinyl is thick enough to deter scratching and flexible enough to bend around the contours of your furniture, stop cat claws from shredding your couch. Scratcher includes 9 grams of organic catnip. Our line of Food Scratch ´n Shapes make a. Food Scratch ´n Shapes. sweet treat for your cat! All scratchers are made from recycled paper and include. Yes, we are. "S-curve", animal print bench designed cat scratcher. Catnip included. Corrugated scratching surface. Item Condition: New. Davie, FL 33314. 4153 SW 47 Ave. UPC: [[UPC\EAN\ISBN]]. This toy satisfies cats' predator instincts for pouncing and hunting mice. No batteries required. KI-OC992 Cat Scratch Pad Spinning Toy with Mouse. Case Size: 11.1" (L) x 17.6" (W) x 21.5" (H). Product Type: Import. Cosmic Alpine Cat Scratcher is a catnip treated reversible cardboard block in an incline position so your cat can climb, and stretch as it scratches. 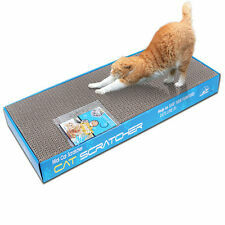 Provides hours of fun and exercise for your cat. Your cat's scratcher can get into the Christmas spirit too! Sprinkle catnip over the tree-shaped scratch pad and your cat will go nuts for their new Christmas gift! BACKROOM BARGAINS INSPECTED! Manufacturers change colors and item details frequently and often do not update pictures or product specs. The Van Ness Scratch ‘N Relax cat scratch pad is made from 100% recycled corrugated cardboard and doubles as a cat lounger. Made in the USA. Ideal cat owners who want to protect their furniture while fulfilling their cat’s natural instinct to scratch and lounge. 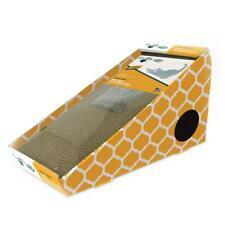 It is crafted from recyclable rugged cardboard to withstand the strongest scratching from your cat easily. It is a fun tool that can entertain your cat for several minutes and also fosters better scratching habit in your cat. Hanging Scratchers. Hanging Scractcher includes 9 grams of organic catnip. monkies to seaonal decor, you're sure. For cats that prefer to scratch vertically we. MADE IN USA. you're looking for, since we are horse and animal people too, and have trained. Hanging Scratchers. Hanging Scractcher includes 9 grams of organic catnip. monkies to seaonal decor, you're sure. For cats that prefer to scratch vertically we. MADE IN USA. and the quality of our service. Features cardboard on all sides which makes it easy for scratching. Constructed with superior cardboard and built-to-last longer than the conventional cat scratcher. Great for exercising and keeping paws nice and healthy. GKC KENNEL CLUB CAT SCRATCH PAD SIZE 15.6" X 4.1" Pets Supply Cats Health New with the original tag. From a pets and smoke free home. Please feel free to ask questions .Thanks and happy bidding !! Sorry no refunds, returns or exchanges, please look all pictures and read descriptions. "WORLDWISE-SmartyKat: SuperScratcher Catnip Scratcher. Imported.". 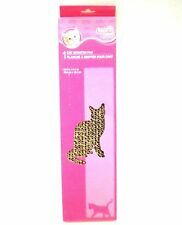 "SmartyKat SuperScratcher Catnip Scratcher-2""X5.125""X18.75""". These are for reference only and should be considered illustrative. Paws-N-Claws Pet Cat Kitten Corrugated Cardboard Scratch Pad Board. - Made of Corrugated Cardboard. - 1 Scratch Pad. 147-213-2-Cat Scratcher-Cat Scratcher. 4153 SW 47 Ave.